The build-up to the new NBA season is well underway and there are stories being played out and devoured by fans across the teams. However, there are some stories that stand out from the crowd and no matter which team you are rooting for in 2013-14, you will be interested to hear the latest about Kobe Bryant and his attempts to be fit for the new campaign. 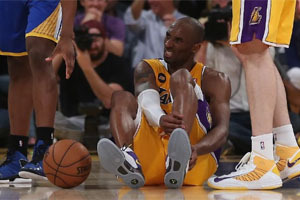 It was in the final three minutes of the April match-up between the Lakers and the Golden State Warriors when Bryant limped off the court. The rumour mill surrounding the injury kicked into overdrive almost straight away but there wasn’t too long to wait until the nature of the injury was confirmed. The following day a MRI scan confirmed that he had torn his Achilles. It’s not as if Kobe Bryant hasn’t had to deal with injuries throughout his career but this was a serious injury and it is not as if the superstar was getting any younger. A common length of time taken for NBA stars to bounce back from this type of injury has been 10 months, and this has been the timescale for players who are younger and who have suffered fewer injuries than Bryant has endured. This means that there are considerable doubts about Bryant’s ability to bounce back but if anyone was going to give it their all to come back fitter and stronger, Bryant would be the player. 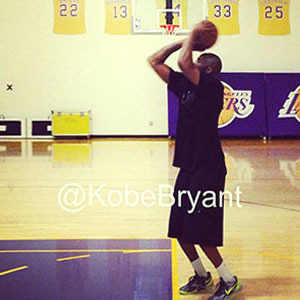 At the end of June, Kobe took to social media to release pictures of himself in full flow in the gym. As you would expect, Kobe was full of himself and his ability to bounce back from the injury which led some to question whether he would ever return to the court again. It’s not enough for Bryant to bounce back from the injury, no mean feat at his age and with his injury track record, but the baller is determined to bounce back in the biggest and most impressive fashion. This is one of the elements where a love or hate identity has surrounded the player. For those basketball fans that are crying out for characters that bring excitement to the modern day, Kobe is a legend of the sport. For those that prefer to do their talking on the court as opposed to showboating and grabbing the off-court headlines, Bryant is an example of everything that is wrong with modern day basketball. No matter what your opinion of Kobe Bryant is, you can’t fail to take note of him and his actions. While Bryant doubts that he’ll be fit for the start of the new season at the end of October, he still believes that he will be back on the court in November or December. One of the main driving forces for Bryant is the fact that he seems obsessed with adding to the 5 championship rings that he has already collected. Two Olympic Gold medals and two MVP awards in the NBA Finals, alongside those five championship rings, indicates that this is a player that knows how to win. It could be easier to say that he has won enough in his career, more than a lot of players, but winners in sport keep pushing on, even when they are up against it. Another thing that will possibly be weighing on Bryant’s mind in his battle against injury is the fact that this is the final season of his contract with the Lakers. When you have a contract that is lined up to pay you more than $30m, you’d do your best to get the shot of another one. 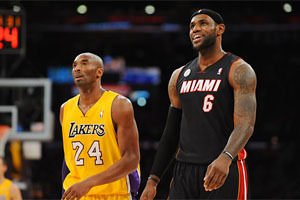 However, recent reports suggest that the Lakers are yet to open contract talks with the players. Bryant has previously stated his willingness to stay with the Lakers for the remainder of his career but the next few months are likely to influence what happens to Kobe on and off the court for the foreseeable future.